Creates a simple menu of your custom taxonomies and their associated terms, ideal for sidebars. Highly customisable via widget control panel. 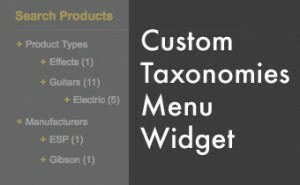 Download the current version of Custom Taxonomies Menu Widget (v1.3.1). Downloaded 25,291 times. Creates a simple menu of your custom taxonomies and their associated terms, ideal for sidebars. Highly customisable via checkboxes to select which custom taxonomies and terms are displayed in the menu. Extract and upload the folder custom-taxonomies-menu-widget to your /wp-content/plugins/ directory. Please ensure that you do not rename any folder or filenames in the process. Go to the Dashboard > Appearance > Widgets page, where you can now see the Custom Taxonomies Menu Widget in the available widgets, ready for use in any of your theme's widget areas. In order for this plugin to be visible to Site Admins, the plugin has to be activated for each blog by the Network Admin. Note: This is just an example with dummy taxonomies/terms to show what the widget control panel looks like. Your widget control panel will display your custom taxonomies and terms.